Last Day to Enter Your Penny Projects in the Value VIllage/Savers Giveaway! Just popping in to let you know that today is the last day to submit your penny projects to enter the Value Village/Savers giveaway! It can be anything - big or small - so there's still some time left to put something together :) We've received a bunch of amazing entries so far - all of which will be featured later this week! Enter here or via email at samaakhan[at]gmail[dot]com. Hey guys - Happy Friday + Jummah Mubarak! On a side note - there are 3 days left to enter your penny projects for a chance to win $150 giftcard at Value Village/Savers! 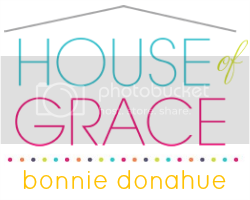 So confession time - the unsettled-ness of the new house is driving me nuts! We've been here 2 months and there is still a ton left to unpack. 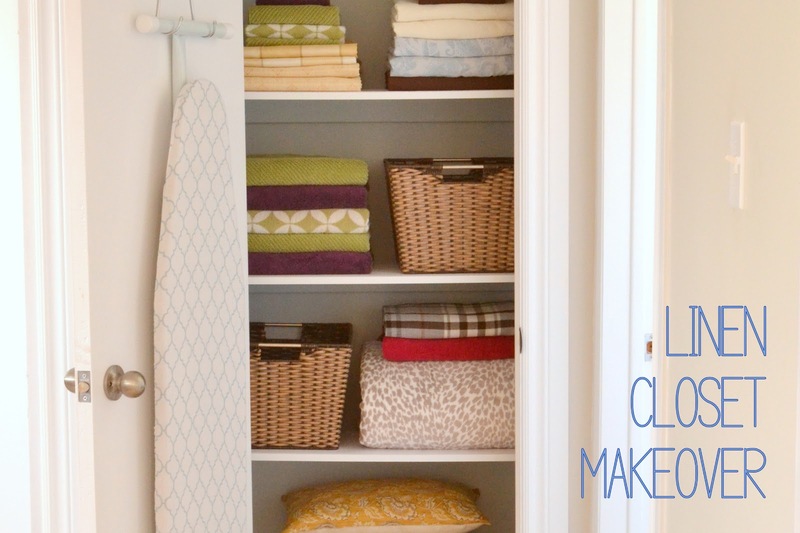 You know that feeling where everything is disorganized and you don't know where to start? Yeah, that's been me for the last 6 weeks or so. In all fairness it's partly because there's nowhere to really put things away - we have a lot of space but not so much storage. But the fact that I'm a master procrastinator isn't helping matters either. I am SO ready to be rid of all the clutter. 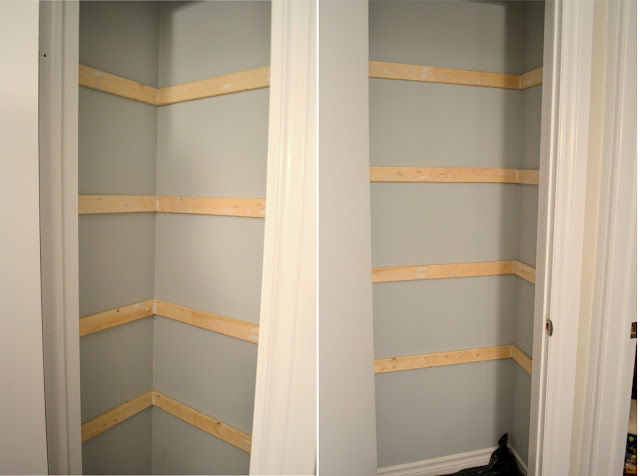 So naturally I was really excited to finally check some storage off our to-do list last weekend: the linen closet. It's a small start, but it's a start! 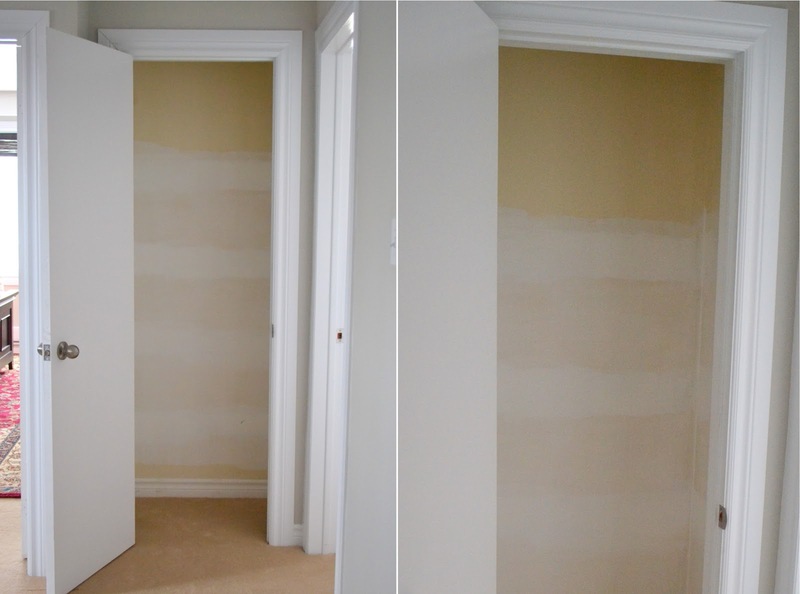 When we moved in the closet was in pretty sad shape - gross yellowed paint and no shelving. You could see the patches where the previous owner had fixed up the drywall, presumably from ripping out the old shelves (which I'm guessing, from the state of the other closets, were pretty gross too). Since there were no shelves I just piled a bunch of stuff in there, and for weeks I avoided opening the door in case everything fell out on me in an avalanche of bags :) So last weekend we finally got around to making it functional. I thought about wire shelving vs solid shelves, and although wire shelves are airier, I'm just personally not a fan of the lines they create on fabrics - plus the solid shelves actually worked out cheaper. We started with a quick paint job to freshen things up - a gorgeous blue grey called 'Light French Grey' by Behr. Then we got to work on the shelving - the hubs picked up 3 8ft-long 1x3s and cut them to size for new supports. 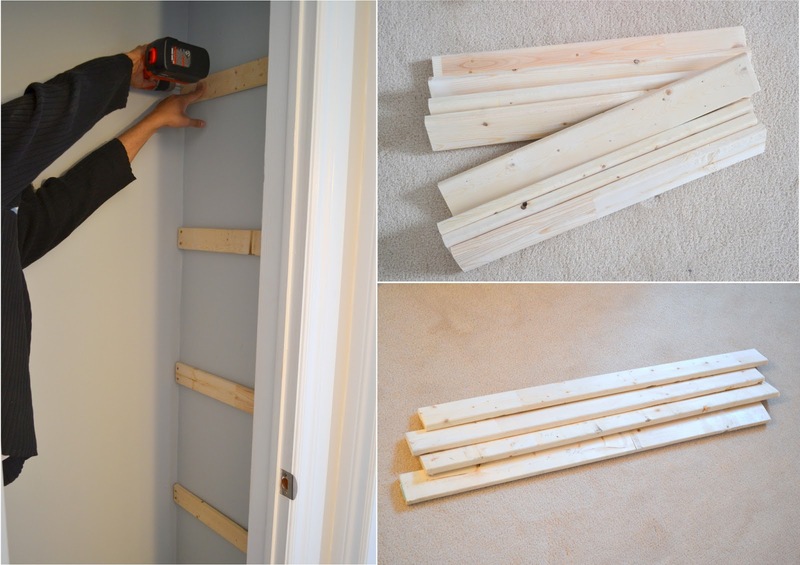 I measured out the spacing for the shelves and then we attached the supports to the studs (pre-drilling the holes and then securing them with screws), checking that everything was somewhat level along the way. I wanted the supports to look really neat so we also made sure the screws were sunken in a little, then I spackled all the holes. I also caulked the corners where the supports met up for a more seamless look. 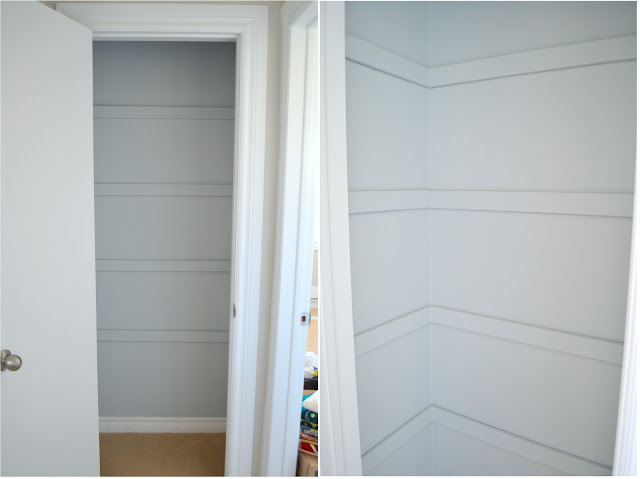 Finally I gave the wood a light sanding and then painted out the supports to match the walls. You can still see them a little but they blend in to the walls pretty well. After that we just placed the shelves on top - we had them pre-cut at Home Depot from 8 ft pieces of laminate shelving that they carry in the lumber section. It turns out I made the top shelf a little too high - there's a ton of room up to the ceiling but the opening to the shelf isn't tall enough to put anything really big up there, but luckily there's enough room that I can still pile things up. I've already started putting a few things away. This isn't everything that will be going in the closet so it's very misleading - it won't be quite this sparse for long :) But I LOVE when things are neat and organized so you can only imagine how I'm swooning over this linen closet :) I already had the iron holder, so all in all the supplies only cost us around $25 - not bad right? I can't wait to tackle some of the other closets! 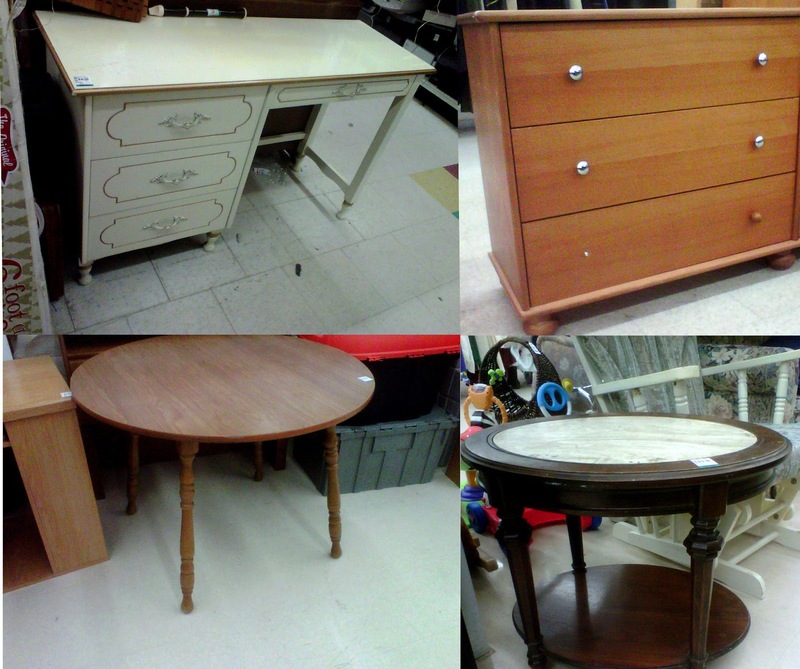 Win a $150 Thrifting Spree at Value Village/Savers! 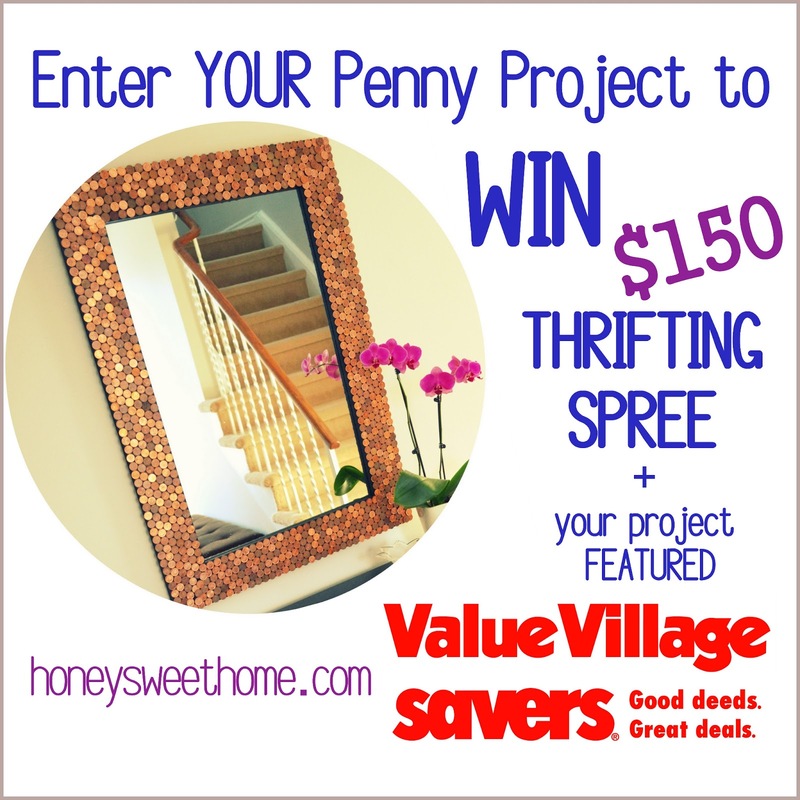 Super exciting giveaway to share this morning – don’t dump those old pennies just yet :) I’m partnering up with Value Village and Savers stores to offer one of you guys a chance to win $150 for the thrifting-spree of your dreams! 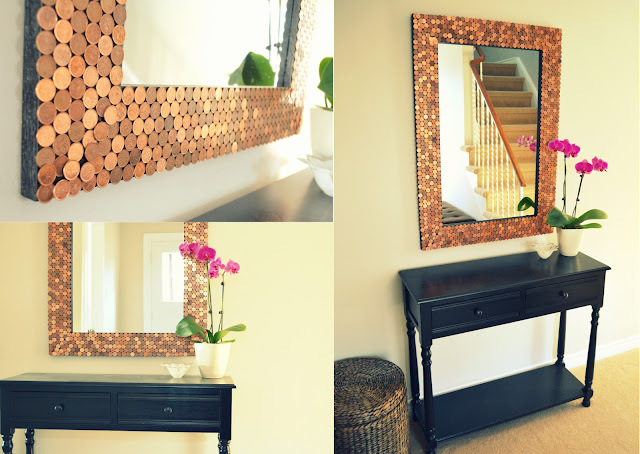 In honour of the Canadian penny’s recent retirement, we would love to see how YOU are repurposing the coins! It can be anything – big or small – that includes the penny. The contest is open to both Canadian and American entries, and the winner will receive a $150 gift card to spend on whatever their thrifty heart desires at Value Village and Savers stores! 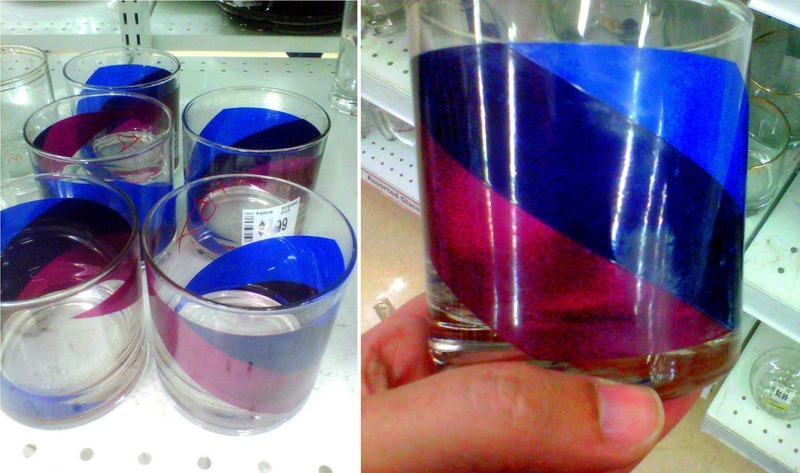 These gorgeous glasses caught my eye from several aisles away - aren't the colours amazing? Kind of wishing I brought them home right now. They had tons of great baskets and bowls - I especially liked these wooden ones for coraling random stuff on an entry table or nightstand. 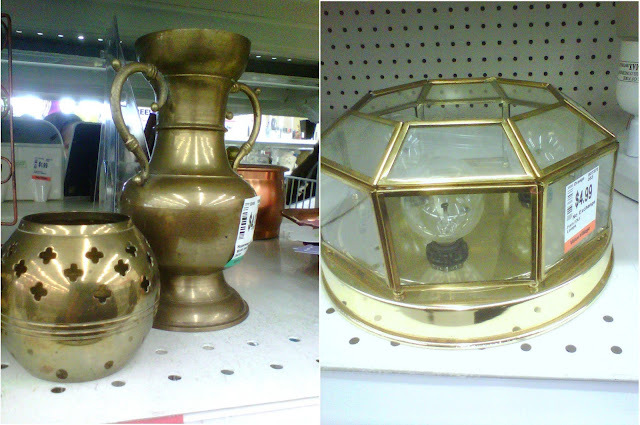 I've been crushing on gold and brass for awhile now and I can totally see these dressing up a styled bookcase. 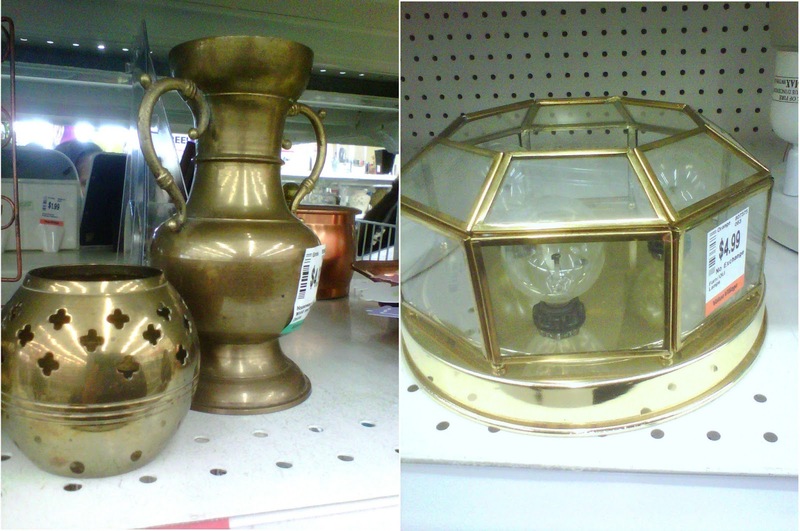 The light fixture on the right was a little tacky no doubt, but picture it without bulbs and the base - wouldn't it make a great terrarium? 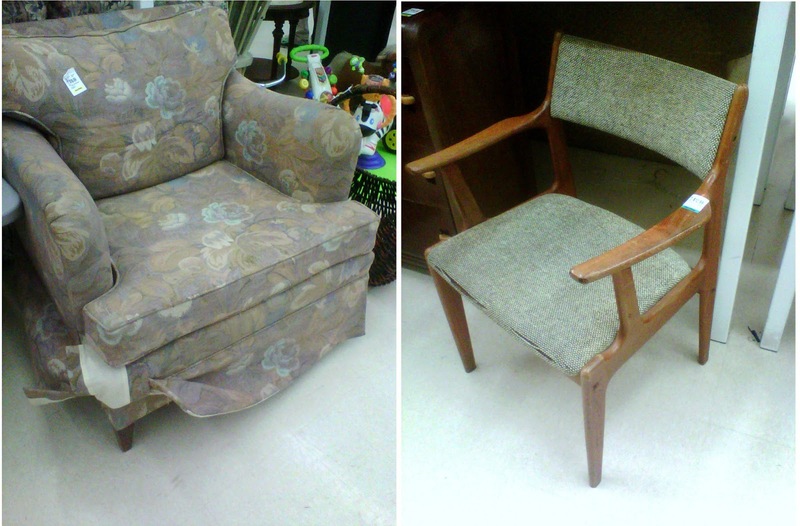 The armchair on the left had a beautiful shape, plus a peek under the skirt revealed gorgeous tapered legs - all it needs is a new upholstery job! The mid century mod chair on the right was also very cool, I'd love it redone in a punchy new fabric. 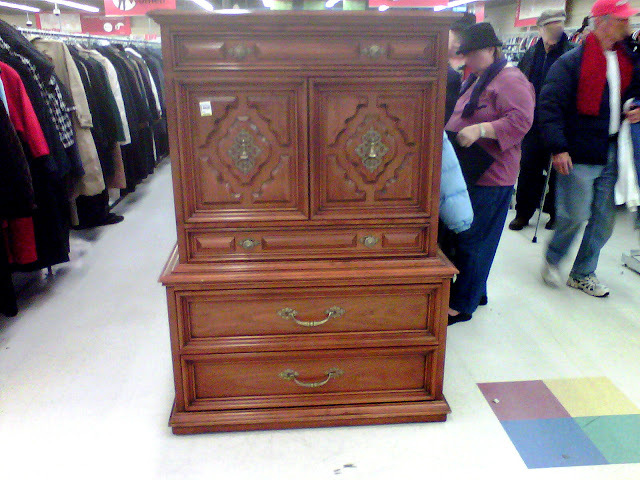 I actually spotted this piece awhile back at VV but I had to include it here because it's just that gorgeous - I still regret passing it up! It had spectacular lines and the most beautiful hardware on the doors. I'd have painted it out but it looked great as is too! The clothing section is definitely the biggest part of the store - although I still had design on my mind when I took a browse - how great would these fabrics look repurposed as throw pillows? 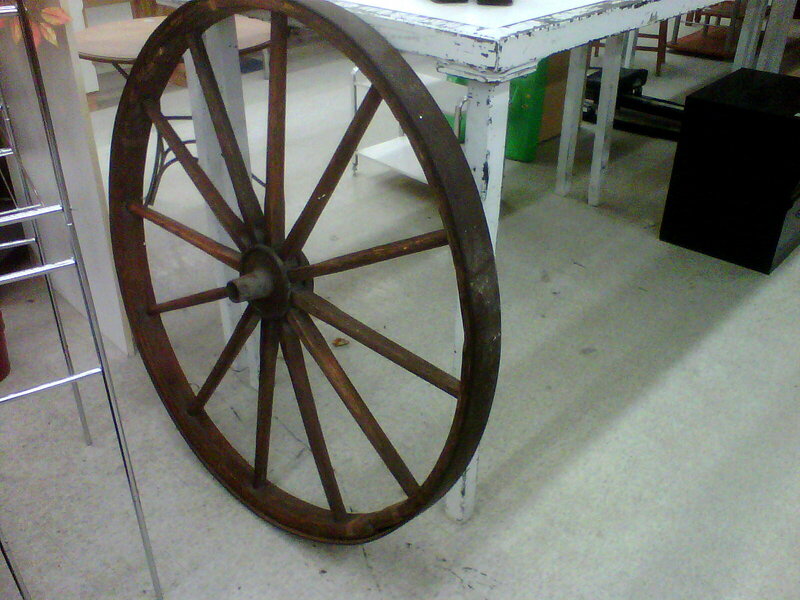 Not sure where this big old wheel was from but it would make for some very cool rustic art! 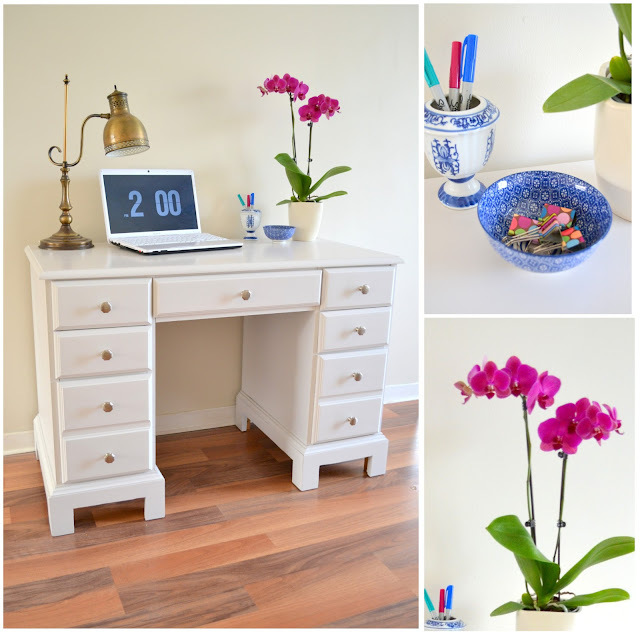 A few other pieces that caught my eye: This sweet little desk perfect for a girl's room, another cute dresser that just needs some new knobs, and a great breakfast table under $20! The side table was also one of my faves - it had a marble inset top and the prettiest legs - could you imagine it painted out in white?! 1. Create or design something using the penny : whether you have jars and jars of old pennies or you just want to get your craft on, we want to see your penny DIY's! 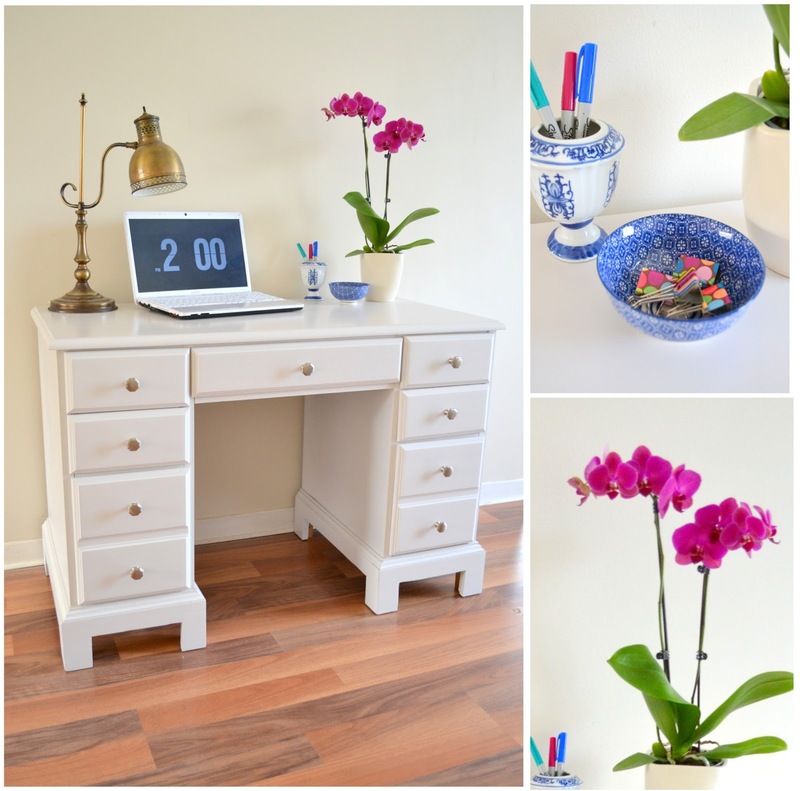 For a little inspiration, check out this post on penny tile. 2. Snap a photo and submit it: email your submission to samaakhan[at]gmail[dot]com. Alternatively if you have a blog, you can link it up below! 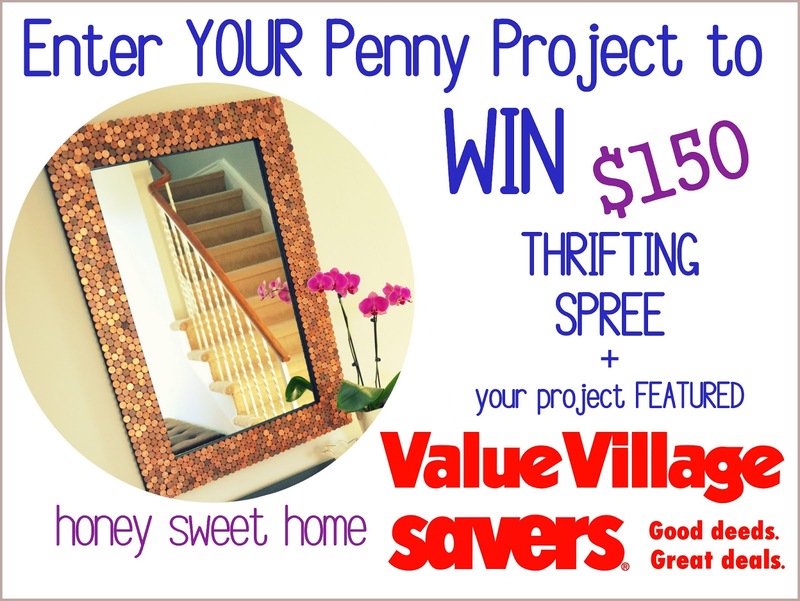 The contest will be open until Monday Feb 25th - after which we'll pick one lucky entry for the grand prize - $150 giftcard to spend at your local Value Village or Savers! Entries are open in both Canada and the US. Submissions will be featured here on Honey Sweet Home as well as Savers/Value Village's Pinterest page! Can't wait to see your projects! One of the things we knew we wanted to do when we moved in to the new place was a BIG reno in the basement. 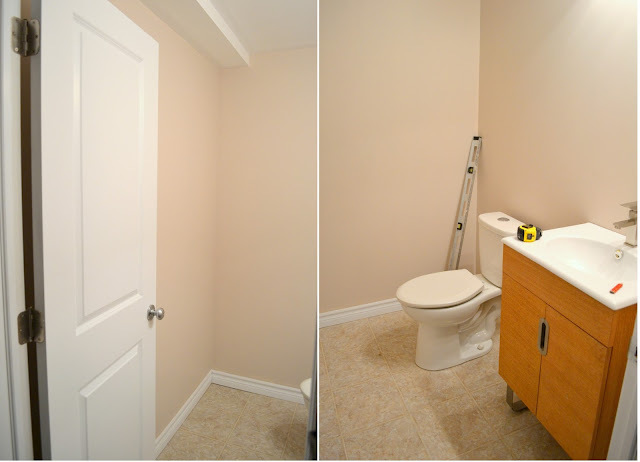 It was already somewhat finished but we had a few changes in mind – the first being adding a shower to the existing powder room. Clearly there wasn't space in the bathroom to add a shower, but luckily there was a huge storage closet just behind the empty wall on the left side - plenty of space to add a big shower, with room to spare for a good sized storage closet. 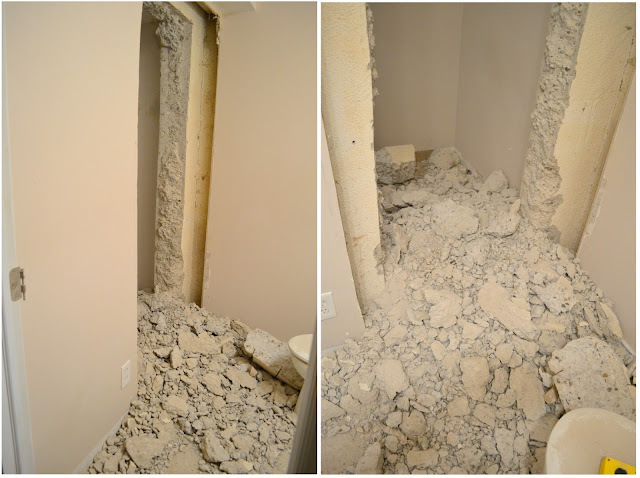 The only bump in the road was that the wall we needed to cut through was solid concrete - yikes! We considered other layouts but short of moving the whole bathroom, anything else would really cut into the living space. One of the contractors we brought in for an estimate was up for working with the concrete wall so we stuck to the original plan and got started on the work last week. The contractor was planning to put in a steel support beam but after opening up the drywall he realized it wasn't a load bearing wall, so they were able to skip that. 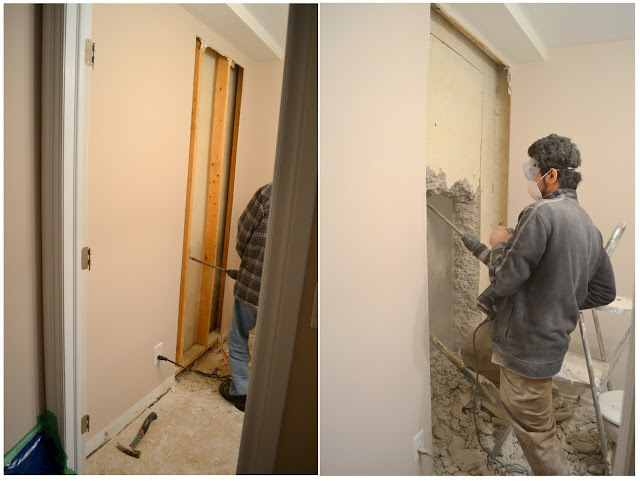 The hubs had some time off and worked with the guys all week - in fact I may have picked up the jack hammer myself a couple times ;) They had a cement saw too which was a lot faster, but it generated WAY more dust, so they used the jack hammer for most of the demo. At this point the rubble definitely had me questioning whether this was worth it - that and all the DUST! We covered the entire basement in tarps and sealed it off from the upper floors with a plastic drop cloth (plus we don't have ducts) but the dust is still everywhere. I have no idea how it traveled up 3 floors, but pretty much every surface in the entire house is covered in a thin layer of soot. So if any of you are local and want to come help me clean, I'll love you forever :) But I'm trying to ignore all the dirt and keep my mind on the finish line - pretty shiny tiles! More details to come as we make progress! For now stay tuned tomorrow for a big giveaway contest! 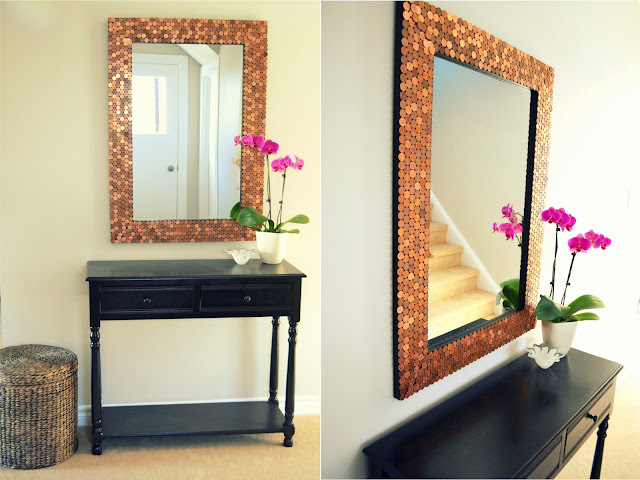 In honour of the penny's retirement, the Saturday edition of the Toronto Star featured the work of several artists re-purposing the coins, including a mirror I recently tiled with pennies. I was so thrilled to be featured! You can check out the full article at the Star's website here. I also did a super short interview with the CBC National last night (Feb 4th), which also got picked up by CNN. Kind of crazy exciting right?! It's literally only a few seconds, but you can check it out on CBC's website here - it starts about 2 mins and 45 seconds in, or at CNN's website here. 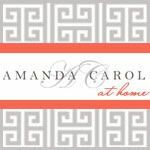 I blogged about loving penny tile last year, but to be honest, as much as I loved the idea, I wasn't sure if I really wanted it in our home. I thought it might look a little too homemade or just kind of odd. 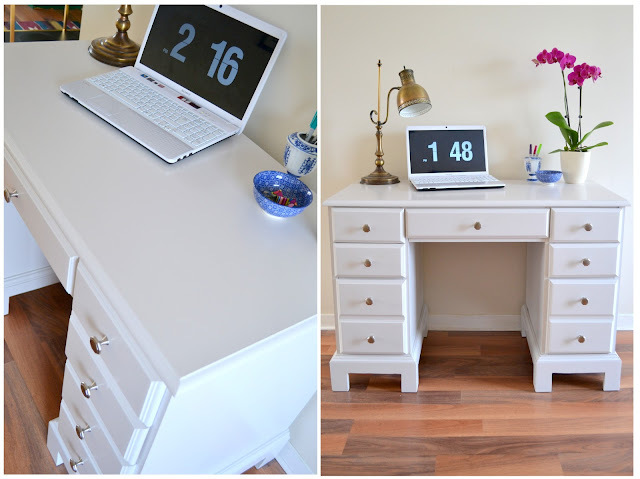 But we decided to give it a try, and I have to admit - I'm so happy with how it turned out! I love the look, especially all the different shades of copper and how the frame sort of shimmers in the light. The hubby is a pretty big fan too :) I went with a wide frame so the penny border could be a little chunky. I also played around with the pennies a bit to see what arrangement I liked best and how to line up the corners (I ended up just hiding some of the gaps by adding a few coins on top of the first layer). The project took about $9 in pennies, so pretty time consuming, but the best part was going through the coins - I found a few from the 50s, but the oldest was 1939! I originally had something completely different in mind for this space, but we both really love the light the mirror reflects into the entryway. Plus its a fun farewell tribute to the Canadian penny! Happy Friday loves! Inspired by the blanket of snow that we came home to last night, I have a bright and fresh makeover to share today – this sweet little desk! And no - that yellowish tinge wasn't created by my camera - this was for reals. 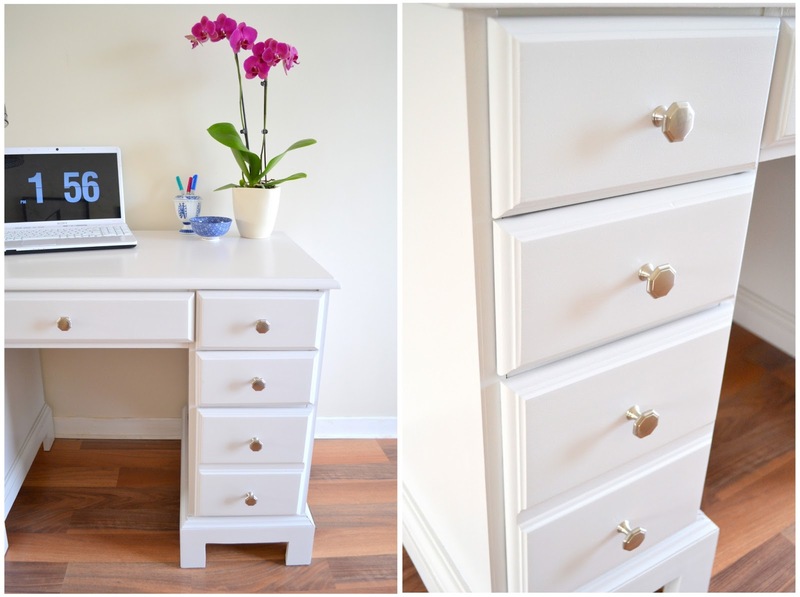 The finish was dated, and those pulls just weren’t doing it for me - they might look fab somewhere else but on this piece there were just too many of them. Like little bats flying at you...yikes! 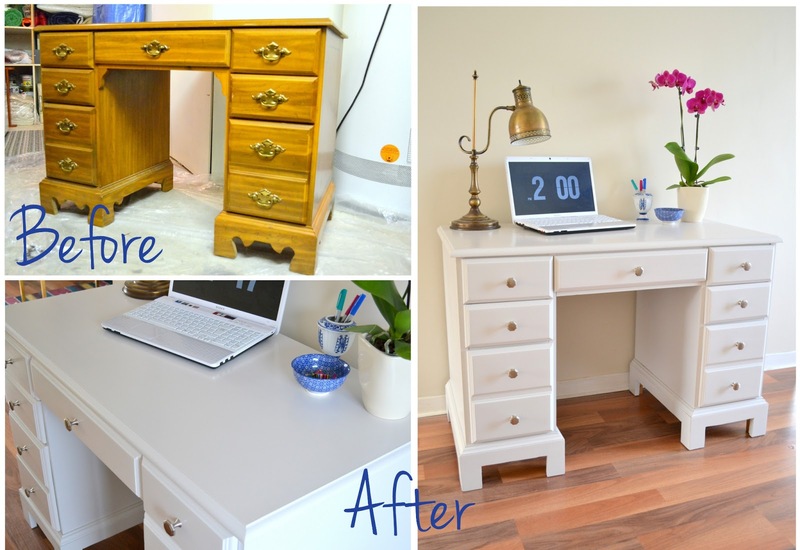 But a little love and a bright shade of white revived this desk from tired to timeless! I wanted the new hardware to add a little interest to the plain drawer fronts but still be inexpensive - since there are so many of them. These great new geometric knobs did the trick - cheap and chic! I found the little blue bowl at Winners and I'm ridiculously in love with it. The vase was a $1 thrift store find. Both lovely additions to my growing obsession with blue and white that all started with this lamp. 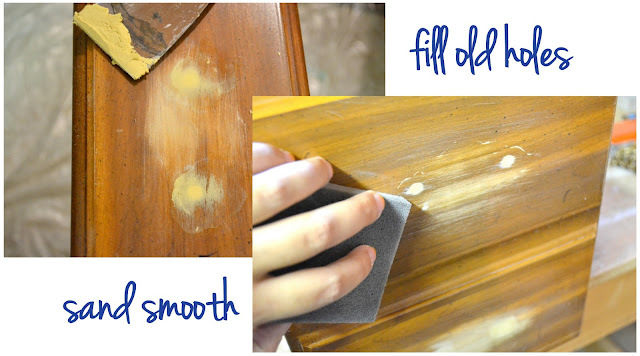 I started the desk's makeover by prepping the drawers for new knobs: filling up the old holes with wood filler and sanding them smooth. I wasn’t digging the original curvaceous legs either, so the honey squared them out with a jigsaw. 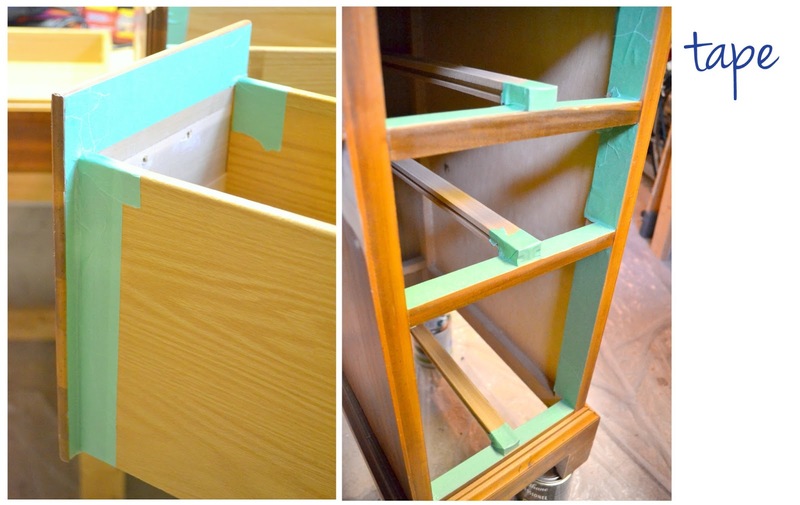 To keep the paint job looking neat I also taped off the drawers and the interior of the desk.